The weather outside is heating up, and so is federal spending! This past spring Congress passed a bloated $1.3 trillion spending bill that – for the first time ever – will push federal spending over $4 trillion, costing taxpayers $33,000 per household. The national debt topped a sizzling $21 trillion this year, and, in the next ten years, Washington spending is expected to surpass $7 trillion. This is unacceptable — taxpayers deserve better. It’s time to chill the federal government’s red-hot spending spree, which is why this summer Americans for Prosperity is calling upon Congress to freeze discretionary spending! Cool down by reading some fun facts about federal spending and ice cream below! Thomas Jefferson was reportedly the first American to write down an ice cream recipe. He was ALSO the first president to enact a spending freeze in government, which reduced the national debt by more than 30 percent in just eight years. The average American eats 6 gallons of ice cream a year at a cost of $5.00 a gallon. 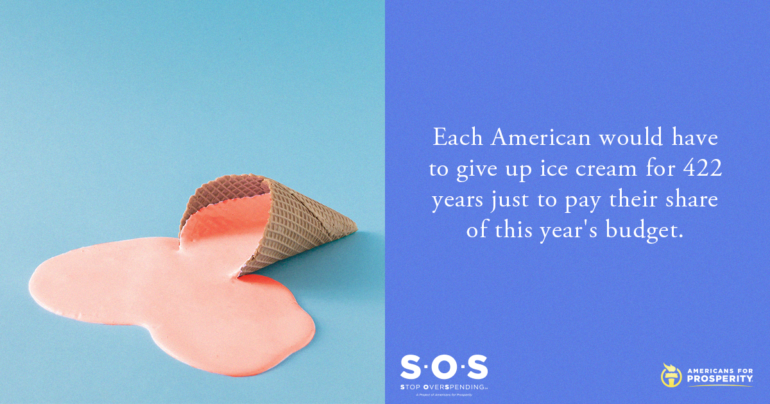 To put in perspective: each American would have to give up ice cream for 422 years just to pay their share of this year’s federal budget. That’s a LONG time to go without ice cream! This year, the federal government will spend $4 trillion dollars, while Americans will only spend $5.5 billion on ice cream. That ratio seems off! Think paying off the national debt at nearly $65,000 per person is costly? At one New York City restaurant, you could order two scoops of the Frrrozen Haute Chocolate Sundae, the most expensive sundae in the world, which contains 5 grams of 23-carat edible gold ice cream, with a diamond spoon for just $25,000. And you’d still have money left over! New Zealand overhauled its entire federal budget and cut spending. At just 22 percent, the Land of the Long White Cloud has one of the lowest debt to GDP ratios in the world. Yet Kiwis still eat more ice cream per capita than Americans. Maybe if we lowered our debt ratio, we could eat more ice cream than New Zealand! Washington’s spending is out-of-control. But there is hope! By enacting a discretionary spending freeze this year, we can put federal spending on ice and create a path to fix the rest of the budget in the future. Tell Congress to put taxpayers first by freezing federal spending today!